Sign up here to participate in our 2 Week THM Challenge! I'll provide a meal plan and shopping list to make it even easier! This month's 2 week-long menus are prep-ahead menus – meaning you'll do a cooking session to prepare ahead, and enjoy ready-to-go (or nearly ready) meals during the week! If you don't have time for a cooking session, don't worry – you can just make each meal as it comes up on the menu. Feel free to join our Facebook Group for additional encouragement! Sign up here for your free menus! Sign up to get everything you need to join us for the 2 Week THM Challenge! 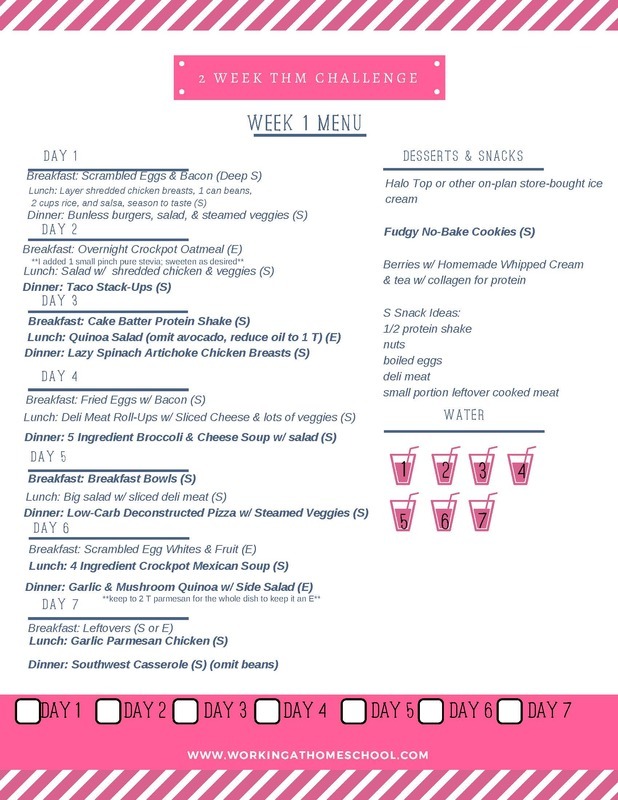 Hi Jen – I ‘signed up’ for the two week challenge, however I’me having difficulty navigating the site to download the recipes. I keep getting the ‘I’m In” invitation box. I got the e-mail to verify my enrollment, but I can’t get further. Please help. Thanks in advance for your time and reply. I signed up for the 2 week challenge and somehow deleted the week 1 menu and recipes. I have week 2. Can you resend week 1 to me? Thanks so much! I really appreciate all that you do for meal planning. It’s such a blessing for me. Hi! I sent it out!